Established in October 1973 to supervise the cease-fire between Egyptian and Israeli forces and, following the conclusion of the agreements of 18 January 1974 and 4 September 1975, to supervise the redeployment of Egyptian and Israeli forces and to control the buffer zones established under those agreements. The mandate for this Mission expired in July 1979 and the troops were withdrawn. Awarded for 90 days consecutive service between 26 October 1973 to 24 July 1979. A circular bronze alloy medal, 1.4 inches (35mm) in diameter. On the obverse, the representation of the UN symbol surmounted by the straight letters UN, both in bas-relief. On the reverse, an inscription bearing the words, "IN THE SERVICE OF PEACE" in English (and only in English). A 0.5 inch (12mm) bronze ring, which holds the ribbon, passes through a small hollow ball at the top of a claw joined to the top of the medal. The ribbon bears a wide central band of a sand or buff colour symbolizing the Sinai Desert with two narrow dark blue lines through the middle, representing the Suez Canal. Two wide bars of UN blue appear at either end. Each subsequent Tour of duty in UNEFME II is recognized by the issuing of a representative silver numeral (i.e. '2' for a second Tour, '3' for a third Tour etc) which is worn centered on the ribbon. The use of a post-nominal is not authorized for this medal. 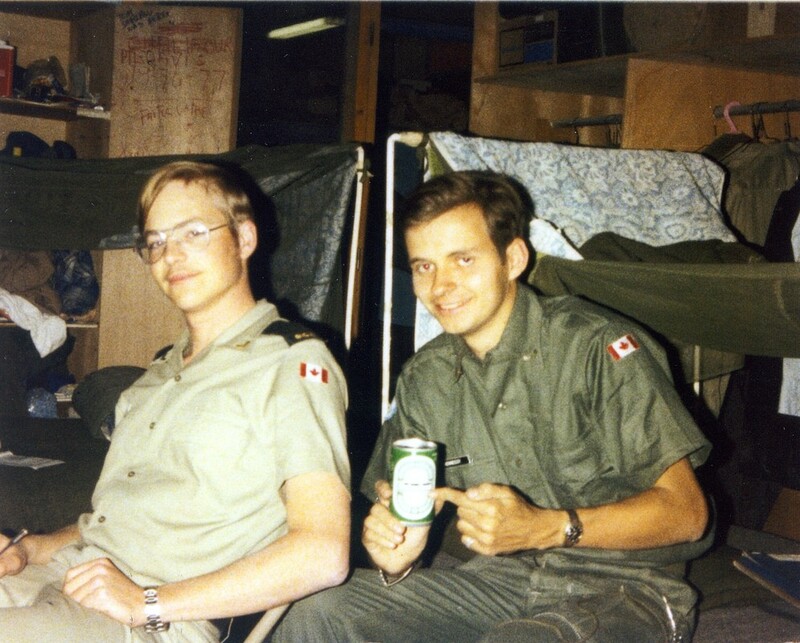 Gunner Noel Dykes and Gunner Mike Hennessy enjoying a beer in Ismailia, Egypt during their UNEFME II tour. Both members were appointed Acting Gunners for the tour from their substantive rank of Bombardier due to 'time in' calculations based on days of total service.